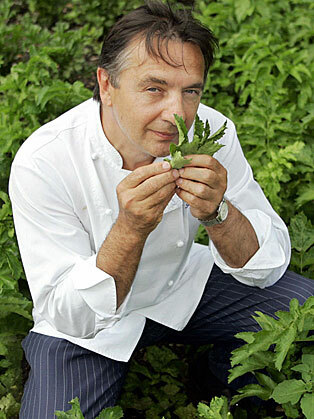 One of the world's most respected chefs, Raymond Blanc is totally self-taught. His extraordinary story begins in Besançon, the capital of the Franche-Comté region in eastern France, between Burgundy and the Jura mountains, where Raymond was born on 19 November, 1949. He was inspired by the local terroir, and most of all by his mother, the formidable Maman Blanc who used fresh, local and seasonal produce to produce meals for her family; meals full of goodness and love. In the summer of 1972 Raymond came to England to work as a waiter at the Rose Revived restaurant in Oxfordshire. One day, when the chef was ill, Raymond took over the kitchen. His career was born! In 1977 Raymond and his wife Jenny opened their first restaurant, Les Quat'Saisons, in Oxford. They put together all their meagre savings and mortgaged their house to raise the cash. Les Quat'Saisons was an overnight success, winning Egon Ronay Restaurant of the Year, and two prestigious Michelin stars. Maison Blanc, Raymond and Jenny's bakery and patisserie opened in Oxford in 1981 and was soon supplying Harrods and many top London restaurants with authentic French bread and patisseries. It was in 1984, however, that Raymond fulfilled a personal vision, creating an hotel and restaurant in harmony when he opened Le Manoir aux Quat'Saisons in Great Milton, Oxfordshire. Le Manoir is the only country house hotel in the UK which has achieved two Michelin stars for a total of 30 years. "His house is as beautiful as a tale of Lewis Carroll," observed the acclaimed French food writer Gilles Pudlowski. In 1991, Raymond Blanc established The Raymond Blanc Cookery School, welcoming both enthusiastic amateurs and professional cooks to the kitchen. Based at Le Manoir, the school provides the opportunity for amateur cooks to develop their skills while learning some of Raymond's kitchen secrets. Raymond opened his first Le Petit Blanc brasserie in Oxford. His aim was to be the best within the brasserie scene in England - serving good quality, freshly prepared food at a price that was accessible and represented excellent value. In 2006, Le Petit Blanc Brasseries were relaunched as Brasserie Blanc, offering French classic and modern dishes made with fresh, seasonal ingredients at affordable prices. A place to relax and enjoy 'real French food, close to home'. There are now some 20 Brasseries Blancs in England. Never one to jealously guard his secrets and passion, Raymond has championed and nurtured some of our most famous chefs personally in his kitchens (Marco Pierre White, Martin Burge, Michael Caines, Bruno Loubet and Eric Chavot among others). It's no wonder that he was voted the AA's Chefs Chef of the year. In 2007 he was awarded an OBE by Her Majesty the Queen in recognition of his services in promoting culinary excellence and for raising awareness of the importance of healthy food as a central element of family life. In June 2013 he was awarded the Legion d'Honneur, the highest French decoration. Raymond is a best-selling author, and his BBC television series have included The Very Hungry Frenchman and Kitchen Secrets. His most recent six-part series is How to Cook Well, broadcast on BBC2 in the summer of 2013. Raymond is the father of two sons, Olivier and Sebastien, by his marriage to Jenny. An ackowledged champion of sustainability, Raymond is President of the Sustainable Restaurant Association and Ambassador for Sustainable Fish City and the Marine Stewardship Council. He is patron of Earth Trust. He is also Vice-President of Garden Organic, the UK's leading organic-growing charity, and Countryside Ambassador for Campaign to Protect Rural England. He works closely with Royal Horticultural Society and Kew Royal Botanic Gardens. Raymond is patron of SeeSaw, which provides grief support for young people in Oxfordshire. He is an ambassador for Action Against Hunger. He is London Ambassador for the London Food Board. He supports many charities and is a member of many associations, such as: Slow Food UK; Fish2Fork; Thames Valley Farmers' Market Co-operative; Club des Cents; the Academy of Culinary Arts; the French Foreign Trade Advisors Group in the UK; the Restaurateurs Association of Great Britain; the Guild of Food Writers, Maître of the Confrèrie de la Chaîne des Rôtisseurs, and Disciples d’Escoffier of Great Britain.